Our Story - Karsa Spa. Are you ready for a REAL massage?! The idea to build Karsa Spa was born on a road trip to Pura Lempuyang in 2012 by Wayan Karsa, his wife Nyoman, and Jen True, a lover of most things Bali since she was first called here in 1982. Wayan and Jen met in 1989, when Jen ventured along the ridge on a narrow, dirt trail leading upwards from the Campuhan bridge. She emerged from the jungle at the beginning of the village of Bangkiang Sidem,and was met by a young deaf boy who gestured to her. Did she want to drink a coconut? After she followed Made home to his family compound, his elder brother Wayan was sent up the tree to bring down a coconut. A fun afternoon was had by all playing chess, drinking coffee and attempting to communicate in Bahasa Indonesia, English and sign language. Jen continued on her merry way backpacking through Asia with her partner and presto, the following year had a bouncing baby boy Jex, who was born Deaf. Jen always remembered that clever young boy on the ridge and his family, and returned many times with her children, developing a long term friendship with the family. Made sadly died as a young adult, Jen's kids grew up and left home and she finally built a small but cozy holiday home on the ridge behind Wayan's family compound in 2006. 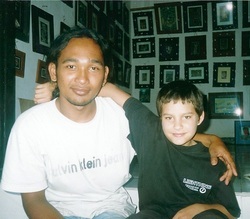 Meanwhile Wayan married gorgeous, happy Nyoman from Mengwi, has three beautiful children and built Karsa Kafe and a villa in 2007. Hard work, good luck and blessings from all the Bali Gods and Godesses has led to the family having five villas now. UPDATE AUGUST 2014..... We welcome Ayu, our first Deaf therapist who has joined the team! Ayu is already doing excellent foot massages, facials and manicures / pedicures! Thanks to Suri at D Network www.dnetwork.net who introduced Ayu to us. If you have a business in Bali please contact DNetwork who are an excellent service providing support to people with disabilities who are looking for work opportunities. The follow up support has been fabulous and Ayu is already a loved and valued member of our team! 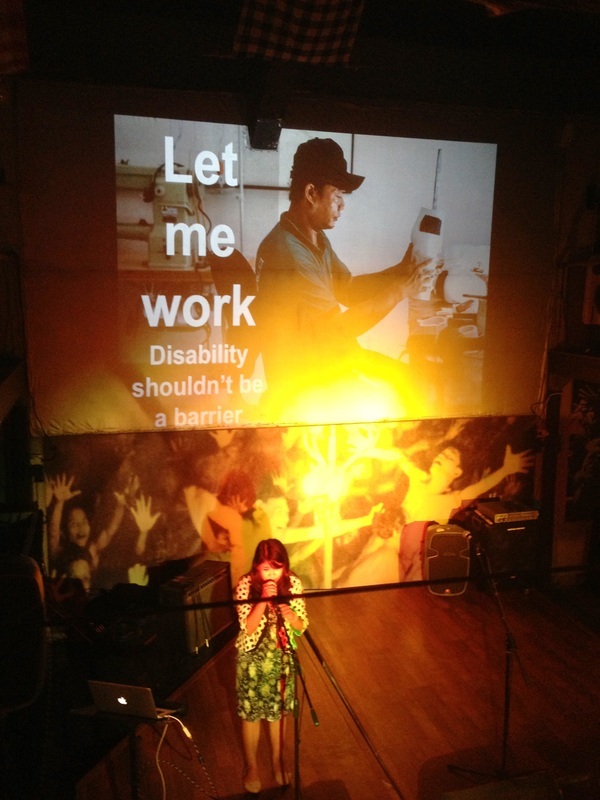 The wonderful Suri from DNetwork speaking at a recent Pecha Kucha night in Ubud, informing and encouraging local businesses to employ people with disabilities www.dnetwork.net for more information!